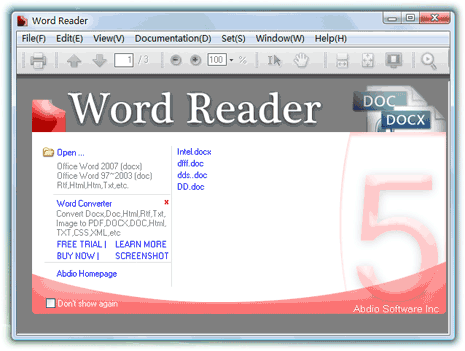 Word Reader is a free application that allows you to access and read word files on the computer. Using this application, you can read doc format word files (as generated by Microsoft Word 97-2003). It also supports MS Office 2007 Word format Docx file. Other file formats that open like charm in this application include: htm, html, rtf and txt. It has neat interface and support number of languages: English, Chinese, German, French, Italian, Japanese. Download Word Reader and read Word files with ease without having to install premium software. They are crooks. They are not free at all, and want your credit card details at the end, before they do anything. They shouldn’t say ‘free’ in the first place. Does what it says it does. Not much else. Good for viewing otherwise cumbersome files.